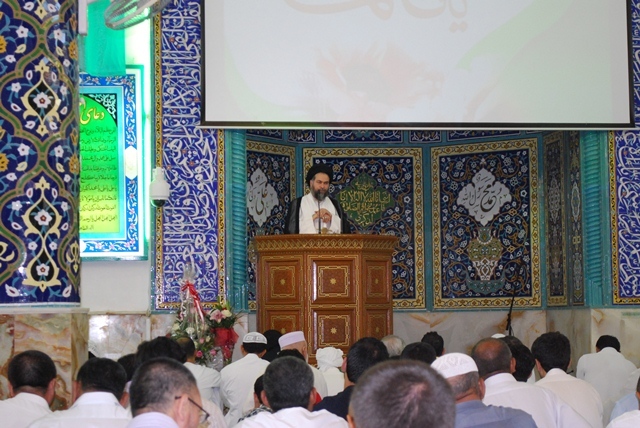 On 24th August, the Friday prayer was held in Imam Hussein (a.s) Mosque Dubai by Ayatollah Sey’yed Mahmoud Madani. The following is brief of the first sermon. In first sermon after Allah’s praise, encomium and reciting peace upon Mohammad (s.a) and his immaculate pure and chosen family he advised himself and all the prayers to have the Allah’s virtue and performing the obligatory rules and avoiding taboos and follow up the limitations and rules of Allah. He continued his previous subject of virtue obtaining the lessons from Nahj-al-Balaqa’s sermon of Mottaqin that says:”the virtue man is stable in life’s adversity events”. He explained that there are parts and happenings in our daily life that we like or dislike. It is impossible to make all the happening to be as per our interest. Everybody likes never get old, but it will happen, they don’t like to be sick and need the treatment and medicine but it may happen. We like to have our beloved relatives around but we know that the death will separate us. So there will be some happenings I might not like but this is inevitable. So what we should do if happen the things that we don’t like? Imam Ali (a.s) tells us to be patient in those happening in the life that you dislike them and continue to the patience. He gave an example of visit of Imam Ali (a.s) of one of his companions that lost his son. Ali-Ibn-Abitalib (a.s) told him” If you be patient it will pass and if you be impatient also it will pass but if were patient you will be praised otherwise you will be blamed”. He concluded if we are wise, we should keep our patience in whatever dislike happens in our life. After that he continued his regular discussion about the exemplary society. He told “ Thanks God that during last two and half year, we discussed about the exemplary teacher, worker, father, mother, child, Shia, Haj , Jihad and exemplary nation which we discussed last week. Now I will start to talk about the exemplary family. We will see what characters should be in an exemplary family as per Qur’an’s verses, hadith and narrations of ahl-al-bait (a.s) then we should look at our family to check how close are ours compare to what should be and if they are similar then we should keep going in the same way other wise to correct our family accordingly. Then he explained that the family is not only a dorm to be used when you are tired of everything else to come and rest or it is not the leisure place to just have fun there and enjoy, it is a school! It has two teachers as parents and a few students as children or even it has some teachers as children and two students as parents. The future of our society is relayed on the teachings happening in our families now. The main problem which makes families to be dismantled is the manner of the family. Ayatollah Madani brought to examples of families that have referred in Qur’an. First talked about the family which is the point of the chapter 108 of Holy Qur’an “ Enna Atainak Al Kowthar…” the Imam Ali-ibn-Abitalib (a.s) and Fatima-Al-Zahra (s.a) which last only nine years but its blessings continued till now and will last forever till last day and from Imam Hassan (a.s) ‘s generation we have too many outstanding like Seyed Bahr-Al-Uloom, Allameh Tababtaei, Martyr Moddarres, and from Imam Hussein (a.s)’s generation we had Imam Sajjad (a.s) and Imam Baqir (as.) .... Imam Mahdi (aj.) which are the top people in their time and after and also Imam Khomeini (r.a) which made his big revolution and changed the world and awakened the Islamic nation. You can see how blissful this family was and the affect that made during the years on Islamic and world’s history. Then he explained another family which has named in Qur’an. The Abilahab’s family and explained how aggressive he was acting with prophet and new Muslims and his deep enmity to Islam. He got a contagious illness and his wife left him and when he died nobody even likes to bury him and they throw rock pieces from far till he buried. About the importance of the family he gave an example of two men one is bachelor and fasting all the day and vigil the night to pray and worship comparing to another man who has married and working the day normally and sleeping the night and brought an Hadith of Prophet Muhammad (PBUH) that the married one is better than the other. He continued that this is not my word it is our prophet word so let’s have leniency in marriage of the youth not for our considerations but for prophet’s word and order. He continued that the marriage make the requitals double and protects the faith. We have an Hadith narrated from our prophet that “Whomever get married for the God sake or make facility for others marriage deserves to be in full support of Allah”. Then he counted three main steps on shaping a family are decision for marriage, ____selecting the right person and funding for the family. He added that there will be nothing important than spending time for caress and grow up the kids and attempt to protect family. He continued that will continue this subject next Friday and finished first sermon by praying for protection of the families. The second sermon was in Arabic for Arabic language audiences.